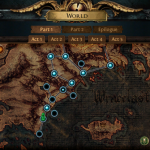 Act: A section of Path of Exile’s main story. Each act has a town, quests, and a story arc contained within it. Active Skill: Any skill that performs an action is an active skill. Most skill gems provide you with an active skill. Affix: The modifiers (or mods) that are randomly assigned to items. A magic item can have two affixes; one prefix and one suffix. Most rare items can have six; three prefixes and three suffixes.